At long last, Minecraft is here! Actually, it's been here for a while. But the folks at Mojang have finally torn the Beta label off of their magnum opus, releasing a new update that adds a ton of new features. In a small series of articles, I'll discuss how to get started with the game, how to set up a server to get your friends in on the fun, and how to install mods to tweak and customize your Minecrafting experience. Don't let the blocks fool you. Under Minecraft's colorful cubic facade is one of the most complex world-building games this side of Dwarf Fortress. Your first stop should be a visit to the Minecraft website to purchase the game and create a user account. From there, you'll download an executable that contains the game. You'll need to be connected to the Internet the first time you fire up Minecraft. Once you've logged in to your account, you'll need to create a world. There are two game modes to choose from: Creative and Survival. Creative mode lets you fly about, creating blocks out of thin air and building whatever you'd like. Survival is proper Minecraft, complete with combating nasty critters, foraging for food and supplies, and mining for materials. I'll be going with Survival, as that's where all of the fun is. If you're antsy to get started, just press Create New World. For a bit more control over your world, select More World Options; these options will let you decide whether to let randomly generated structures like dungeons and villages appear, or you can enter a Seed value. Though the worlds of Minecraft may seem to be randomly generated, this impression isn't strictly correct. Every world automatically generates a Seed value, which can be whatever you'd like--it's ultimately converted into a numerical value. Worlds with the same Seed value are identical, so if you find one you like, you can share it with your friends or start over in the same world, in the event that things go awry. The official Minecraft forums have an entire section dedicated to sharing Seeds, so browse there if you'd like a solid start. When you press the Create World button, you'll be dropped off...somewhere. Your Minecraft world has a number of biomes, from forests to deserts, so it's anyone's guess where you'll end up. But you'll be equipped with naught but your fist, so your first order of business is to get some gear together. Approach the nearest tree, and punch it. Left-clicking allows you to interact with the world with whatever's in your hands; in this case, your fist. Just look around for a tree, and hit it repeatedly. If you get tired of mashing your mouse button, just hold it down. Eventually, a block of wood will tumble into your arms. Don't stop with just one piece of wood; instead, take out a few trees and get a nice stack of wood together. 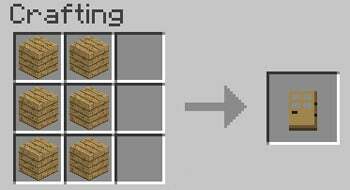 Once you've accumulated a few logs, press E to open your inventory, and drop the pieces of wood into the four slots under Crafting. A new block will appear in the slot on the right. Wooden planks are the basic building block, and we'll need them to get started. 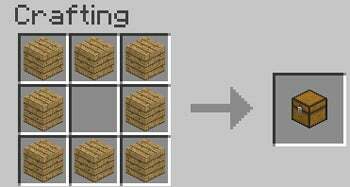 Right-click to get that block into your hand, or hold down Shift and then right-click to convert all of the logs in the crafting slot into wooden planks instantly, and dump them into your inventory. The crafting slots in the inventory are a bit small, so you'll need to build a crafting table to get a bit more room to work. 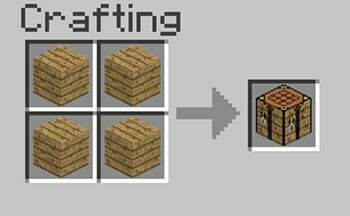 Place four wooden planks into each slot of the crafting area; right-click to drop in one block at a time. You've probably noticed that the inventory bar at the bottom of your screen gets populated with the odds and ends you pick up, and determines what shows up with your hand. You can toggle between the slots by pressing the number keys--1 through 9--or by scrolling with your mouse wheel. Put the crafting table into a slot on your inventory bar, select that slot, and then right-click anywhere to drop the table into the world. Right-click the table to see the larger crafting space. To start with, you should make a few wooden tools: a shovel, a pick, and an axe. First, you'll need to make wooden shafts by placing one plank over another. You can obtain four shafts per pair of wooden planks. Next, you'll combine these shafts with planks to make your tools. Tools break over time, and wooden tools break rather easily. You'll be switching to stone tools at the first opportunity, but you need a few wooden ones to build your first shelter, as it's essential to construct a safe overnight haven immediately, before darkness falls and all manner of nocturnal dangers emerge. You can churn through blocks much faster by using the right tools. The rule of thumb: Strike trees with an axe, dirt with a shovel, and everything else with a pick. The design of your first night's shelter is largely a matter of personal preference. I like to dig a shallow cave directly into the nearest hill, and camp out until the sun rises. Once you've found a suitable locale, don't forget your crafting table: Left-click until it pops up as a floating block--much like the trees, dirt, and stone you've worked through already--and place it in your new shelter. Next, put a door up, to keep the drafts (and spiders) out. All it takes is a few planks, arranged in a doorlike shape. If the sun hasn't set yet, feel free harvest more lumber, and get the lay of the land. Don't lose track of your shelter though: I like to make a few pillars of dirt in a conspicuous place, in case I get turned around. Be sure to get back inside before long, or you'll learn about skeletons, spiders, zombies, and the infamous creepers first-hand. And now you're ready to make it through your first night in Minecraft safely. Time passes in real time, so you'll need to wait for the sun to rise. While you wait, I recommend heading over to the extensive Minecraft Wiki to read up on crafting recipes, and learn more about the various types of blocks in the world. Once the sun sets the interior of your shelter will become very dark, so you'll want to find coal to make some torches. Stone tools are more durable than wood, but you'll want iron for tools and armor as soon as possible. And your hunger meter will start ticking down soon, so you'll need to find food to keep your health up. From here on out, the world is yours to shape as you see fit. Build a storage chest right away, as your inventory will run out of space. If you place two chests side by side, they'll morph into a large storage chest, giving you even more room for your stuff. There's no real “guide” to exploring, per se. The better metal ores are underground; you can wander around outside and find a cave for some old-fashioned spelunking, or you can dig straight down--it's up to you. Once you're ready to see all the things that Minecraft as to offer, be sure to check out our guides to creating your own server and installing mods.